When Herbal Essences came out with their new naked line of shampoos and conditioners I couldn't wait to give them a try. Since I wanted to use more naturally based products on my relaxed hair I decided to make the cleansing conditioner my trial product from the Herbal Essences Naked line. "Water/EAU, Steraryl Alcohol, Cetyl Alcohol, Stearamidopropyl Dimethylamine, Rosmarimus Officinalis (Rosemary), Leaf Extract, Mentha Piperita (Peppermint Oil), Mentha Arvensis Leaf Oil (Field Mint), Menthol, Fragrance/Parfum, Glutamic Acid, Dimethicon, Phenoxethanol, Benzyl Alcohol, Zinc Pyrithione, Citric Acid, Sodium Chloride, Methylchloroisothiazolinone, Methylisothiazolinone." Up until now, I’ve never used a “real” cleansing or co-wash conditioner on my relaxed hair before. When I’d co-wash I would one of my cheaper rinse-out conditioners. So I had no idea what to expect and decided to read online reviews before purchasing. Most of the reviews were good. The more negative ones were from people who'd used the more expensive cleansing conditioners previously and those who thought the smell was too strong. To me the smell isn’t strong, but it’s not pleasant. The consistency of the conditioner isn't runny which is good for application as you don't get it all over the place and waste it. While I like the pump bottle packaging which helps with controlling the amount of product you get out, I can see it being an issue when there is only a little product left in the bottle. 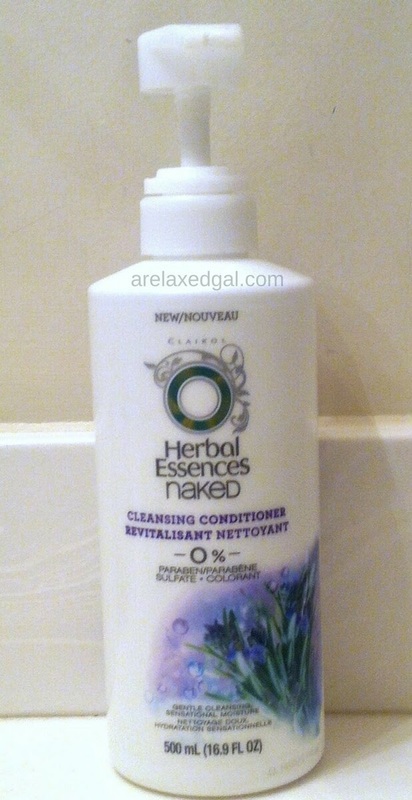 The Herbal Essences Naked Cleansing Conditioner. good, but not great. I’ve used it several times now as a pre-poo and for cleansing and it works better for me as a pre-poo. When I've used it to wash my hair I haven’t noticed my relaxed hair feeling any softer. In fact, my hair would sometimes feel a little dryer after using the cleansing conditioner. Will I purchase this again? Probably not. Once I've finished the bottle I'll make a final decision. After using this cleansing conditioner a few more times I decided it was doing more harm than good to my relaxed hair and decided to not use it again. I ended up finishing it by using it to clean my combs and other hair tools. I even used it in place of shaving cream a few times. Needless to say, I have not and have no plans to ever purchase this again. Thanks for tagging me Savvy Sammy. I'll be accepting.